Lamps almost cover 180 degrees but the PIR is far less than that so putting it on the side of my house to light the path only works when walking from one direction. Hi Richard, Thank you for the feedback. The PIR on the Shield will rotate both left and right and up and down, it sounds like you could try pointing the PIR straight down depending on the height of the lights and this would pick up movement from both directions. Feel free to contact us and I'm sure we can work out a solution for you. Really happy with this light. It gives a lovely white light, sensor works perfectly. Easy to install. Will be ordering another! Good unit, very good output only downside is installation on a brick face. If the bricks are not absolutely flush where you put the light it can be very time consuming getting the unit located on the backplate and the sprung loaded latch to locate. Not the best design in the world. But great now it's up and will probably buy another. I bought one of these to light the shed and gate at the end of my garden. It arrived exactly when it was meant to, and it was quick and easy to install. The light is sufficiently bright for my needs, the sensor works very well and it is east to adjust. The lights are adjustable in two dimensions, so can be aimed to light a surprisingly wide area. I would recommend buying some cable clips to secure the cable that runs from the solar panel to the light. The light is well made from robust plastic and seems to be very well weather sealed. The solar panel is quite small and I was concerned that in winter in the UK it would struggle to recharge the battery. But so far (about 2 weeks in early November in Scotland) it has managed to keep it charged. I would recommend this product. Had a similar product from a well known high street electronics shop. Failed after 2 years after insects and water got inside. I could tell straight away that this unit is much better made. The unit is really well sealed and looks as though it will stand the test of time. The light is bright and you can adjust the time and ambient light level which it comes on at. Does what is says it does - great! I have had the lights up and running for almost a week and have been impressed. They give off a great deal of light and are easy to install. this is a good product that works . Great light and good output. No instructions in box but easy to fit without. I bought this product to fix to the front of the house, to illuminate when there was any movement towards the front door and garage. It took a bit of time to set the timer, which was right for us, but once done the light is very bright and it works great, and gives a good spread of light. I would highly recommend. I bought one unit just after Christmas and installed it. The screws which came with the unit were inappropriate as the bracket for the solar panel has quite large holes. The screws supplied slipped through the holes. So I used my own. As others have mentioned, the unit is not as simple as it should be to locate on the backplate once the backplate is attached to the wall. My assessment of the difficulty is that as you tighten the screws in the backplate to give a firm grip on the wall, the backplate distorts slightly. In the fully firm position the unit would not locate at all. I could achieve top or bottom but not both. I loosened the backplate screws slightly and was able to achieve an acceptable location of the unit but the top clip cannot be located into the unit. It is held in place by the bottom hand tightened screw. This still gives a reasonably firm location on the base plate. The operation of the light is good, very sensitive to movement and adjustable for time and lux. This is not a cheap unit but I think we are all familiar with the ultra cheap solar units which fail over very short periods of time. I am very happy with the operation and feel that it will probably give good service over a number of years. On that basis I bought a second unit and the same comments apply as for the first one. I just cannot get the top clip to locate so I have both units located only by the bottom knurl screw. Both seem secure enough. However, this time more appropriate screws were supplied for the solar panel bracket. A real plus for these units is the separate charging panel and the ability (in my case) of locating them on a south facing wall. As I said, not cheap but my philosophy in life is always that you get what you pay for and I think these are good units which should perform properly well into the future. Also, if it were possible, it would be good if the motion sensor could be adjusted vertically as well as horizontally. My second unit is located on the back of my drive about 20 feet from the road and I do get regular false triggers as it picks up the occasional passing car. I could cut out these if there was vertical adjustment. A good unit which does the job but I have no experience of customer service as I have not had to use them. Pleased with product gives good light , only query I need another couple of meters of cable to get it in position where I can make use of both lights but was told you don't supply extra cable which seemed rather strange . Great product delivered promptly and does what it says. I bought two but unfortunately had a problem with one however the customer service was excellent and all resolved quickly to my satisfaction. Wouldn't hesitate to recommend the Solar Centre ! Recent purchase, arrived promptly, fitted above a conservatory door, very satisfied with the illumination, could do with a bit more flexibility with the lamps for light coverage. Very good service. Great product, easy to fit, and gives exceptional light. 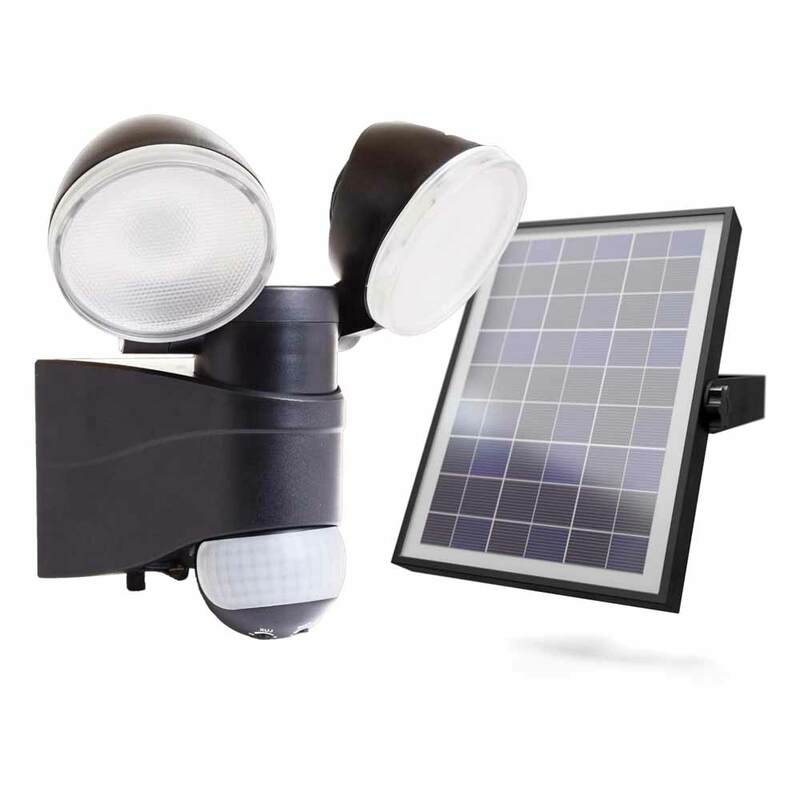 Having tried several different external solar lights we have to say that the shield twin lights are without doubt the best so far. The light is bright and powerful. In fact the most powerful solar lights we've tried. The only small concern we have is that we live in North Wales where it has been known to rain from time to time, and the surround of the solar panel is painted metal so we shall have to see how that stands up to the aggressive Welsh climate. Apart from that small detail we would most definitely recommend them. Good bright light but not picking up 180 degree movement.Any ideas please. The motion sensor offers 120 degrees detection angle at a range of up to 10m can be rotated horizontally through 180 degrees. Well worth trying different vertical angles as this makes a real difference to what does and doesn't trigger the light. An excellent product. Initially we bought two to light the path to the chickens. So impressed were we that we bought two more to illuminate dark spots on our path. The light is white, and although not as bright as halogen they are as excellent replacements the traditional halogen lights we have. When they go, we will use these as replacements. Works well, exactly what I wanted. I spoke to the Solar Centre before I purchased the lights and they were very helpful. Delivery was great, ordered one day delivered the next. I would definitely recommend them. Superb product, easy to set up and install. Definite benefit to have two light sources operating from one main unit. I recently purchased this light to replace an old mains one. The light arrived quickly and was easy to fit. However there was a problem with the sensor and the light didn't work properly. I was very impressed with the customer service offered by the Solar Centre - they responde quickly to my message reporting a problem and sent me a replacement (which works fine) within a couple of days with no quibble. I would definitely use the company again directly rather than go through Amazon. Purchased this one as a replacement and it was so easy to fit up and the lighting is superb. Thoroughly recommend this one for the patio or back of your property. Service and customer help is also first rate. Purchased to illuminate an area around small Aircraft Hangar to add to other security features. Very quick to install. Delivery was next day. The Unit works well and will remain unattended, a real positive. I have only had these lights up for a couple of nights but the light up a very dark area brilliantly . Easy to install and I must say another great purchase from the solar centre, I wouldn't shop any where else for solar lights, great customer service . Service from solar centre was swift and efficient, delivery came as requested and advised. The lights are exactly what we need and what was described. We would purchase again and also recommend to family and friends to buy. Excellent light, easy to install, now up and working. The company went the extra mile for me,, we had wrong goods delivered, but within48 hours the goods were re delivered. Cannot praise them highly enough, and thank you for your swift dealings with us.. as previous purchasers have said, the delivery was well within the time stated, don't know how you do it, but well done.. just wish every company had your customer service. Thanks again. It provides a good light across the width of a double garage. The unit feels quite solid and well made. The separate PV panel is a good weight so at the moment I have left it sitting on the garage roof without further fastening. Installation was easy. No problem with setting the trigger brightness level or on duration. Only downside is there's no easy way of securing the cable from the PV panel to the light . I don't want to drive staples in to the garage roof. However the separate PV panel is essential as the light is fitted on the north side of the house and I need to have the PV panel facing south. I don't think there's an easy answer to the cable problem. I rang the solarcentre with a support question and they phoned me back very quickly with an answer so customer support appears to be good. The only thing I can't vouch for at the moment is whether the PV panel delivers enough charge to the battery in winter as I've only had the unit for a couple of days but everything is looking good at the moment. I am very pleased with this light. For me, it was a cheaper alternative to hardwiring a security light to electricity, and it works just as well without continuing to cost money! I had no trouble fixing it to the wall, or attaching the light to the back plate (I am a 60 year old woman). It is a bright light, with good coverage. My only very slight frustration is that the motion sensor doesn't quite give a wide enough angle for my liking, given that it needs to pick up movement from two directions. Delivery was excellent - fast, free, convenient, and absolutely no hassle whatsoever. I am very happy to recommend this product, and will be buying from this company again. Thank you. Great product, easily installed. Purchased on behalf of elderly friend as carers had been complaining of poorly lit access to property. Installed in minutes without the need of an electrician. Twin light illuminates access and keysafe. Very very happy carers. Great product and as usual, excellent service from the solar centre. Nicely designed product and good value for money. Easy to set up but to get the best result the mounting height needs to be considered carefully. Very pleased and would certainly recommend the product. In addition, I wish to mention the excellent customer service provided by Solar Centre. Their response to my queries were quick and very helpful. They will certainly be my first port of call if I require other solar products. Excellent product , easy to install and gives very good lighting . Ordering is simple and delivery was 'next day' even though I opted for free delivery, which stated 4-7 days ! Have since ordered another one with same delivery.Very pleased all round , well done. The quality of the light fittings I've bought from the Solar Centre has always been excellent and this is no exception. very bright light, sensitive proximity centre and good wide beam spread. Delivery was prompt and free. Prompt delivery, Easy to install, Works well. This is my second purchase of this light as the first one performs so well. Installed at my mothers house and it performs as well as the one at our house. Great product, nice company to deal with. This is our 5th solar light and this is by far the best lighting both the side of the property and also the front door. Easy to fit good bright light, working well. Relatively easy to install and gives a good bright light from both lights. Easy to adjust the lights to point in the right direction. Only had the unit for a few days and at the moment the light operates when it is still quite light but maybe this can be changed with the adjustment. These came with sufficient charge to test and set up immediately. Easy to install and adjust with very good light coverage from the adjustments available. I wanted one with two fairly independent lights to focus in different directions and angles, which this does pretty well. The output from each lamp is very good. I would have given 5 stars had the build felt a bit more robust, but mine is under cover. Initially the adjustments to lux and time didn't seem to be doing anything but it seemed to need a day/night cycle to sort itself out. Could do with a bigger movement for it's sensor. Everything else goes well. Received this light very promptly and fitted it a few days ago, since then we have not had much sun since but it already had some charge and it is working well. It picks me up from quite a distance when I walk down my path in the back garden and I am extremely pleased with it. I have mounted it on the corner of the garage and so it picks me up either way. I have got it to stay on for the shortest time to save on the charge which is just right and it goes off as I go in the back door. Would recommend. By Ralph on 28th Nov 2018. Arrived promptly and easy to install. Good light coverage and charges fine even in Winter. I was so pleased with the two slate PIR lights, and I needed a stronger light ,so I could see for my steps to my front door. We have a very long garden and this light is so bright, that it illuminates the bottom of the garden. Pleased. Bright illumination covering two areas. Mine are targeted at 25 steps approaching the house and an area to the side of the property. Floods the area perfectly. Excellent lights I had them fitted by an electrician fantastic. I can not believe how bright this little light is...excellent, Prompt delivery and managed to save some money as the light was on offer a real bargain. I would highly recommend this light. These are excellent...good price, easy to install and very bright.....definitely recommend these. So pleased with this solar light. Purchased to fit on the corner of a shed to light up our drive and also the path to the front door. The twin lamps were quite stiff to move into the desired positions but just required a bit more pressure than I was giving. There was even some charge in the lamps when we unpacked the light which made it easier work out where to fix it. The solar panel has a good long lead to the lamp and the panel was also easy to fix up. It is not the prettiest looking but does the job it is intended for very well. Would definitely reccomend. Excellent product . Simple to install if you follow the instructions especially facing the solar panel south. Left it to charge 5 days and turned on for great brightness coverage at the bottom of a dark garden path. Will be purchasing another. Very happy with product. Excellent area cover with bright light spread over a wide area. Would recommend and probably re-order. Purchased on behalf of an elderly neighbour who is housebound and has carers four times daily. They access house using a keysafe at the rear door, I had been looking for an alternative to hiring an electrician to mains wire a security light to illuminate the keysafe when I came across this product. It is perfect, just the job, withe the dual light it covers the access and the keysafe. I have been buying from this company for a number of years and can't rate them highly enough. The quality of their products to their customer service is second to none. Well done. Had a problem with these but the unit was promptly replaced. Very bright lights. Shame the sensor has only lateral movement, no vertical adjustment. Excellent delivery.staff very friendly and helpful with order .excellent discount and can't wait for my handyman to put on my shed I am in a wheelchair so it will help me a lot.. Ordered this to show up 4-legged intruders in back garden. Pre-sales queries were accurately answered. Delivery was prompt . The light performs as advertised and serves my intended purpose. Satisfied with the light as it suitably detects from 5m and provides satisfactory light for access. Easy installation. Would recommend and considering buying another. Purchased the Shield Twin Solar PIR to light the front driveway. It arrived very promptly and in good condition. I installed it on the front wall of the bungalow using the provided fixings. The instruction were very clear and it was an easy job, as long as you have the correct tools. After fully charging the unit, as described in the accompanying leaflet I switched the unit on and was delighted with the amount of light it gave off.Up to this point everything was absolutely what I had expected. However as soon as it dropped dark, I noticed the light coming on almost continually, so I adjusted the sensor to its lowest position but this made very little difference. The website stated that the sensor would work up to 10m. but vehicles passing on the opposite side of the road were triggering it a distance in excess of the 10m. and that was with the sensor pointing fully down. Unlike many units it doesn't have a sensitivity adjustment and only limited manual adjustment. After speaking to Solar Centre I was advised to put black insulating tape over part of the sensor, not the best solution but it has reduced the number of activations. I bought this item as my old one had stopped working. I was surprised how quickly it was delivered and how well it was packed. It is a good solid light that throws a good beam and lights up a large area. This is a company I would recommend to anyone. This came even quicker than expected and worked straight out of the box. I have managed to get the PIR set just right to turn the lights on coming and going. Bought this light as I wanted a solar powered light rather than have the hassle of getting a light mains wired, and after reading the reviews. I would say that I am extremely pleased witht the light both in terms of the amount of light emitted, and the ease of installation. If you are looking for a reasonably priced outside light I would recommend this product. Bought for shed at bottom of garden, arrived the next day easy to fit and set up. The detector has good range and the light from the two lights is more than enough for what we need. Very happy with the service too. I rarely buy anything online outside Amazon but would certainly come back to this website for solar lights.